So far, Milligan’s run on X-Men has not really impressed the Revolution. However, the Apocalypse storyline is an improvement over the previous issues. Will Milligan continue to raise his game on this title? Let’s find out. 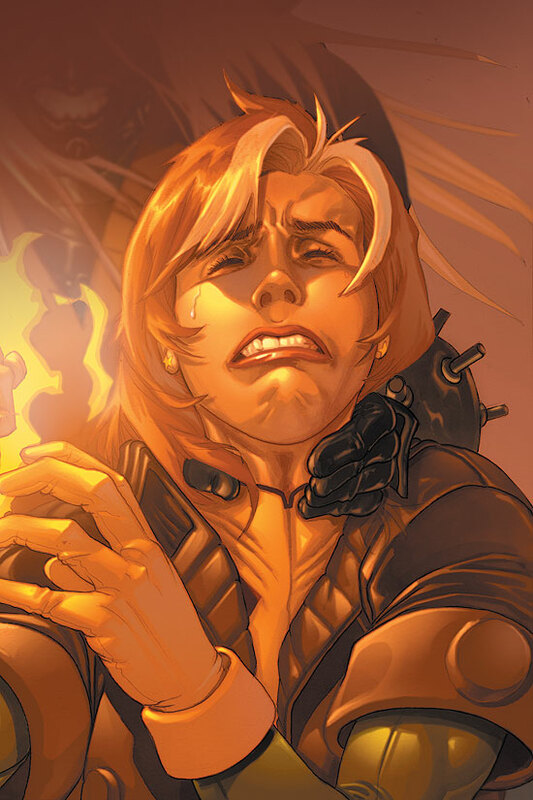 Synopsis: The issue opens with Rogue in shock that Gambit is now the Horseman Death. Remy smacks Rogue around and we have a braaawwwwl! During the fight, Havok destroys a large portion of the antidote that Apocalypse had stored. We then shift to the Horseman War in the X-Mansions looking for Sunfire, the Horseman Famine. And now we have another braawwwwwl! We cut back to Apocalypse’s ship. Apocalypse is preparing to depart so the X-Men must quickly leave the ship. Before the X-Men abandon the ship, Rogue tells Gambit that she loves him but she gets no response. We cut back to the X-Mansion where Emma Frost is no match for the Horseman War. Sunfire then wakes up and blasts War. War decides that since he is outnumber, that he can’t win this battle so he leaves. Sunfire then passes out. Emma is worried that he is so weak that he may not survive and recover. We cut back to the X-Men leaving Apocalypse’s ship. Ozymandias chooses to stay on the ship since the Sphinx has many chambers and it could take Apocalypse years to find him and by then everything will be different. We then see Gambit telling Apocalypse that a part of him does still love Rogue. That he is both part Death and part Gambit. Apocalypse tells Gambit that Death does not love and that he is going to put him back on the transformation machine for “readjustment.” Gambit then tells Apocalypse to back off or he will turn the air inside his lungs into his poisonous gas. Apocalypse backs down and tells Gambit that he won’t need adjustment as long as he stops talking about love. We then cut to the Sphinx appearing over the United Nations building. Apocalypse tells the U.N. that he has creates a meta-plague that can wipe out every single human being on the planet. He tells them that he only has a small stock of the antidote left due to the X-Men destroying most of it in their fight. Apocalypse tells the U.N. that since the mutants have been cut to less than 10% of its former number that if humans kill off 90% of the humans then the surviving 10% shall receive the antidote. Then human and mutants can fight for the resources of the world and the best species shall win. Apocalypse gives the U.N. one week to decide. We shift back to the Sphinx. There Apocalypse is addressing his Horseman Pestilence if she is ready to unleash her meta-plague on the human population. Pestilence says she is and pulls back her cloak’s hood and it is Polaris!! End of issue. The Good: Well, let’s start with the writing. X-Men #185 continues upward swing that X-Men #184 started. These past two issues have been the best in Milligan’s run on the X-Men. Hopefully, Milligan is starting to get a better grip for these characters and is finally hitting his stride. I will say that, right now, Milligan is the better X-writer between him and Claremont. At least Milligan has gotten his stories interesting over the past two issues. Claremont has been practically unreadable. And that breaks my heart to say that. So, Milligan is definitely getting more comfortable with these characters. This Apocalypse storyline has gotten more interesting with each issue. I was thrilled to Sunfire back in action, albeit limited action. I hope he makes a full recovery. I am enjoying Gambit as Death. He is an interesting mix of a Horseman and X-Man. He definitely is no mindless pawn. I would expect to see Gambit be the downfall of Apocalypse in this story. And Polaris has been revealed as Horseman Pestilence! Wow! That was quite the surprise! I was wondering what had happened to her after she disappeared a while back. Milligan did a nice job weaving her back into the storyline. I also like the choice of Polaris as a Horseman. She so desperately wanted her powers back. Well, be careful what you wish for! I also am enjoying Milligan’s use of Havok. Milligan is the first writer to really pay much attention to Alex and actually develop his character beyond being Cyclops’s little brother. I think Havok is a great character and has tons of potential. Plus, he has a great costume and cool powers. Now to the art. Salvador Larroca absolutely rocked it this issue! Larroca just crushed it with X-Men #185. His art was just gorgeous. Seriously, I was so impressed with Larroca’s pencils and inks. The story just leapt off the page thanks to his incredible art. The fight scenes were mesmerizing with the way he drew Iceman’s ice and Havok’s blasts. Larroca’s detail in his art is wonderful. You can stare at his panels forever just soaking up his artwork. 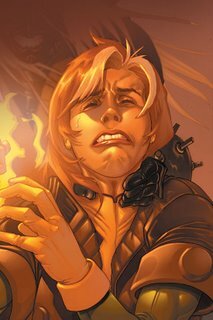 Larroca also has an excellent ability to draw plenty of emotion and feeling into the character’s facial expressions. I just can’t say enough about Larroca’s work on this issue. It really helps to boost the story. I also love the way Larroca draws Havok. He looks bad-assed. And I’m definitely liking Iceman’s new look. It makes him look a lot tougher and stronger. The Bad: I have nothing to complain about when it comes to the art! And, I really don’t have any real complaints about Milligan’s writing. I think he turned in a solid issue. It didn’t blow me away, but the story is getting more and more interesting with each issue. Plus, the bombshell of Gambit as Horseman Death last issue was followed by the bombshell that Polaris is Horseman Pestilence. This current story arc isn’t anything new or different, but it is entertaining. My only other complaint would be the two new “Sentinels” that both clearly look like EVAs. I mean, c’mon, can’t you be just a little bit more original in the creation and design? Maybe Milligan is a big Neon Genesis Evangelion fan and he is trying to pay homage to the anime. Maybe not. Either way, I’m not a huge fan of imitation.